New York is one of the most attractive solar states in the U.S. and ranks #3 in terms of total residential solar installations, second to only California and Arizona. 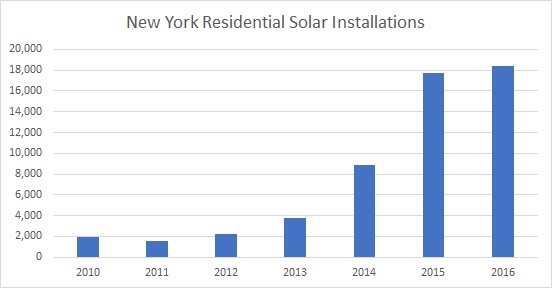 Residential solar installations in New York increased 12% in 2016 to 19,945, albeit at a slower rate than 2015 (100% growth), as detailed in our 2016 New York Solar recap. Solar is a contagious product, as a significant portion of sales are driven through neighborhood referrals (as much as 60% in certain cities). SolarCity illustrated this trend in their analysis of “viral” solar cities. 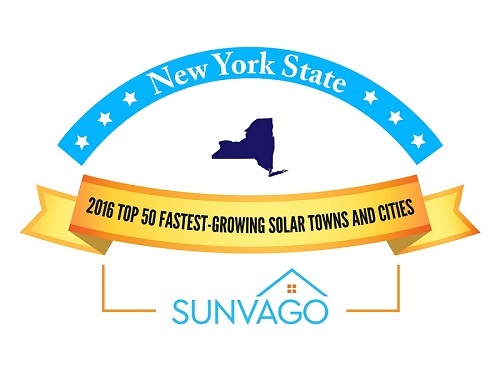 Using data from NYSERDA, Sunvago analyzed the top 50 fastest-growing cities in towns in New York. Note that the data does not include New York City and only includes cities with 50 or more residential solar installations.